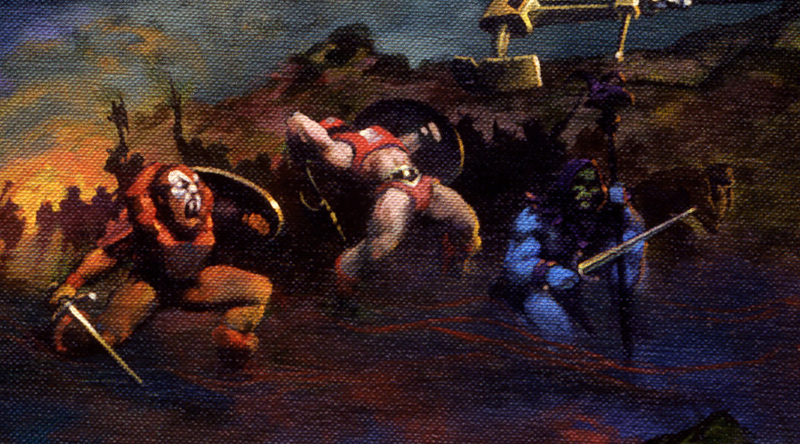 Skeletor’s most iconic weapon has always been his havoc staff, with its distinctive and menacing ram’s skull. The two are so interconnected as to be practically inseparable. 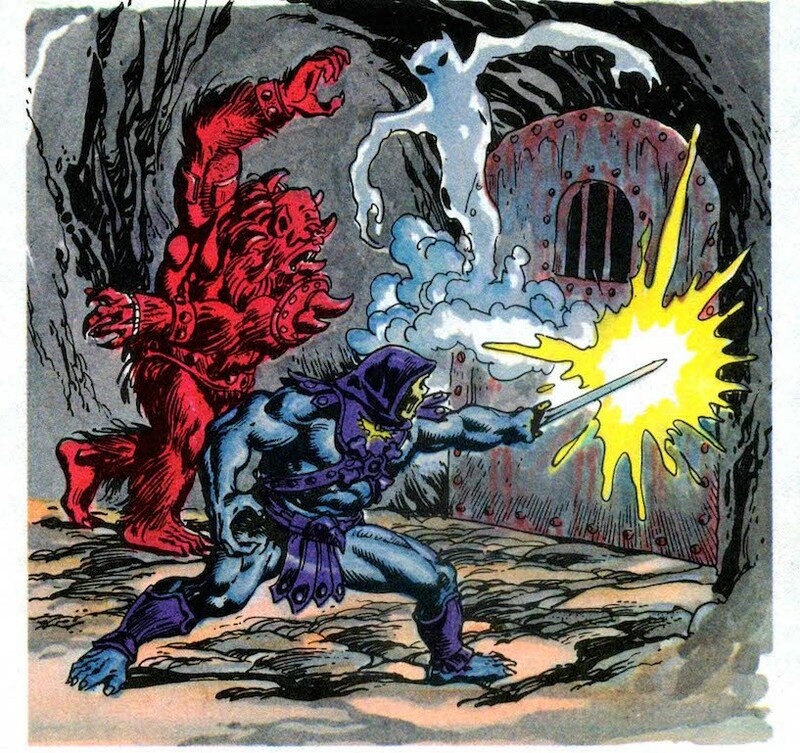 Skeletor also carried his purple half of the power sword, and it made plenty of appearances in mini comics and story books. 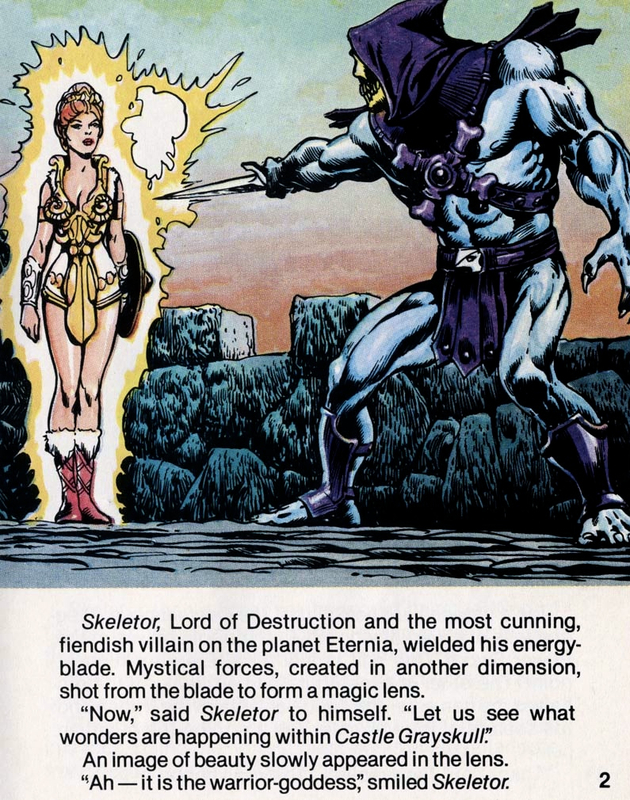 There is however, another weapon that Skeletor carried in the 1982 mini comics (artwork by Alfredo Alcala, story by Don Glut). 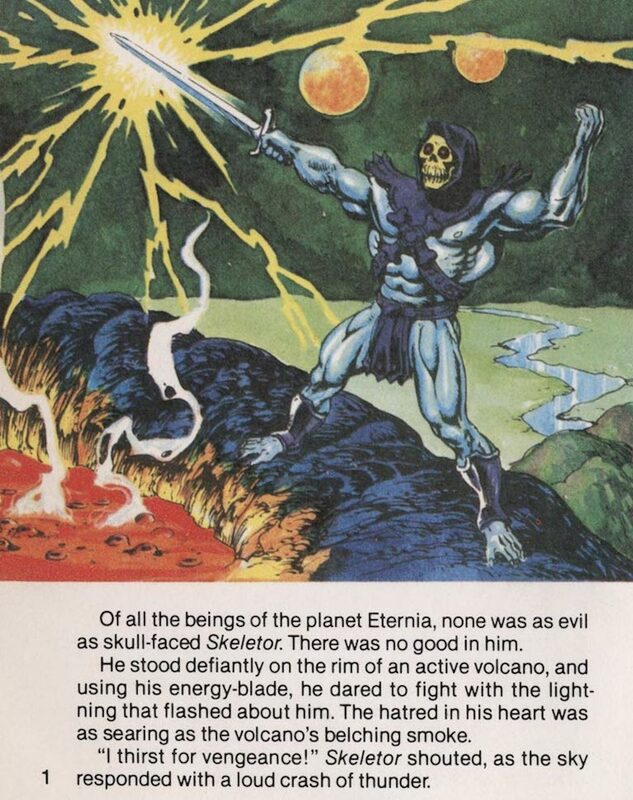 This was Skeletor’s energy blade (sometimes called lightning blade or lightning weapon). It was a fairly ordinary-looking short sword with a curved hilt that was capable of releasing searing blasts of energy, or even calling up magical images. 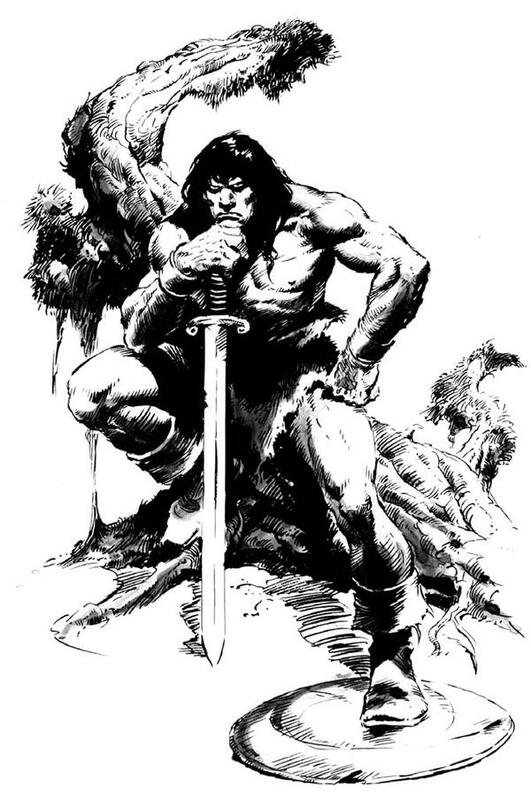 I always assumed that this particular sword’s design was an invention of artist Alfredo Alcala. 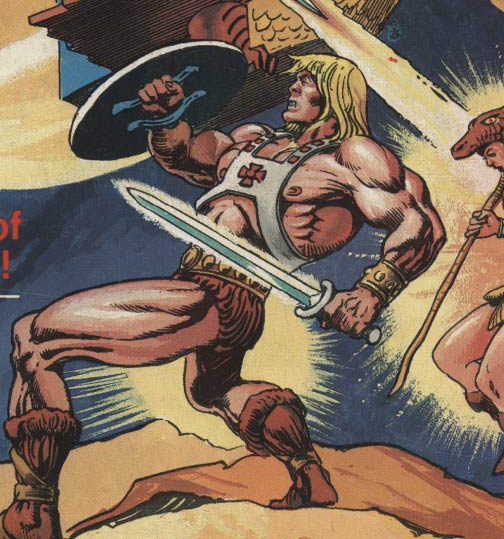 But I recently noticed what appears to be the same sword showing up in early box art by Rudy Obrero. 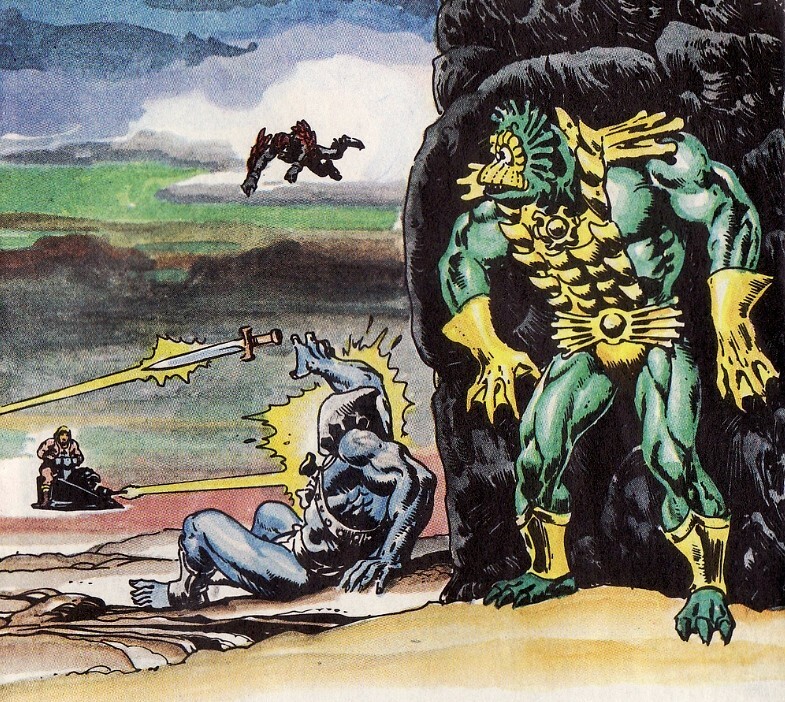 That lead me to believe that the energy blade may have originally come from Mattel*. 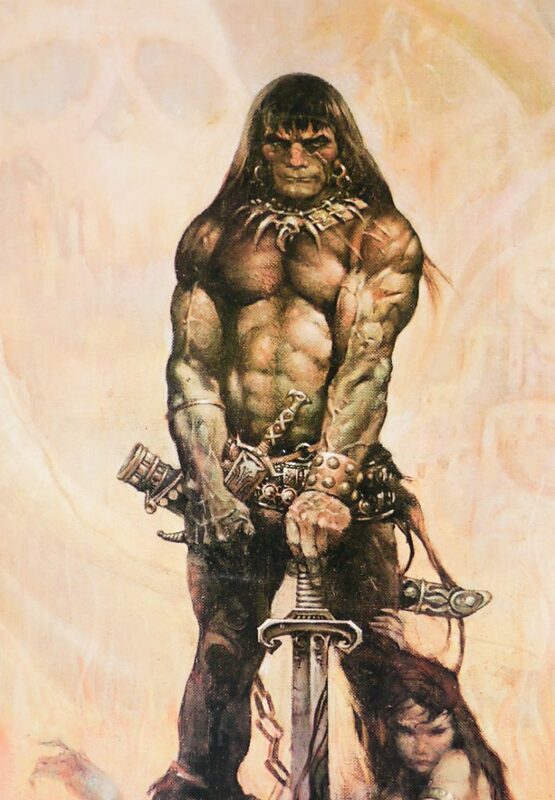 I’d like to think there is a B-sheet lying around in a box somewhere with a drawing of this sword in it. Without definitive proof, of course, we can’t know for sure. 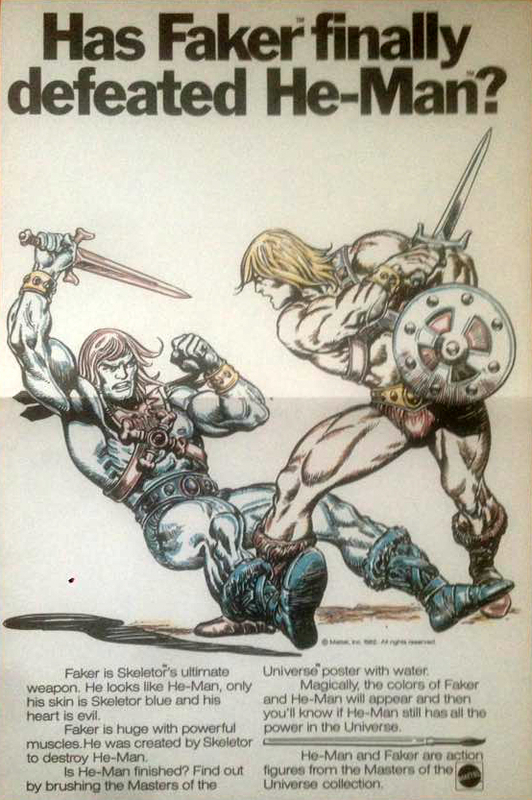 Given this evidence, it seems unlikely now that the common source for this design was Mattel (it’s possible, but I don’t think a strong case can be made for it). 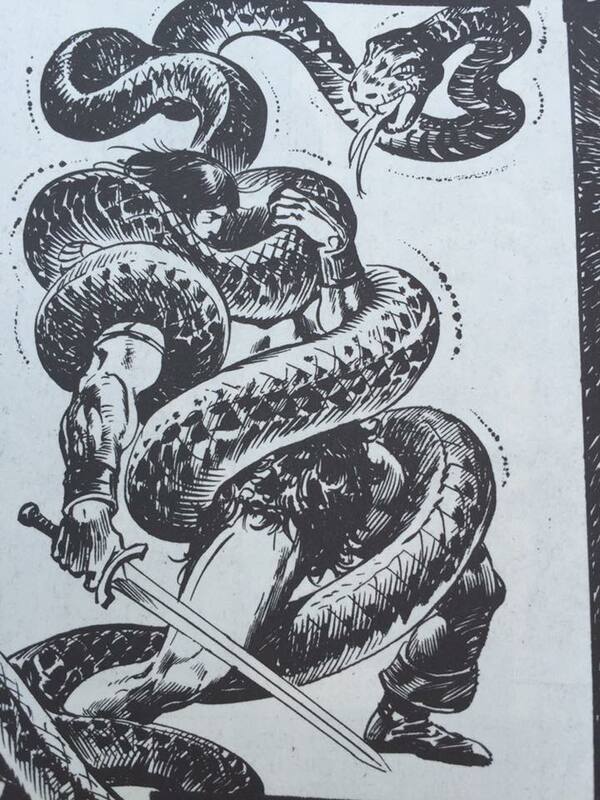 I have to conclude that Alfredo Alcala was drawing upon the fantasy concepts he’d been illustrating for years, and Rudy Obrero was drawing upon general sword and sorcery themes of the ’60s and ’70s. 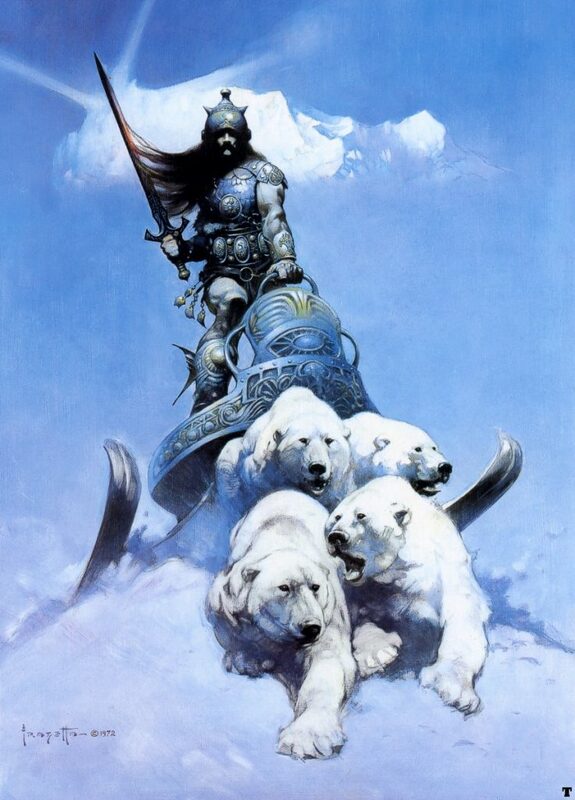 Given Mark Taylor’s Frazetta influences, he probably drew from the same general creative well for his Vikor sword. Thanks to Øyvind for challenging my theory. I think it’s been successfully refuted! I’m wondering if the design for it, and appearing on Box art is in fact a placeholder or generic weapon. It kinda reminds me of Transformers. 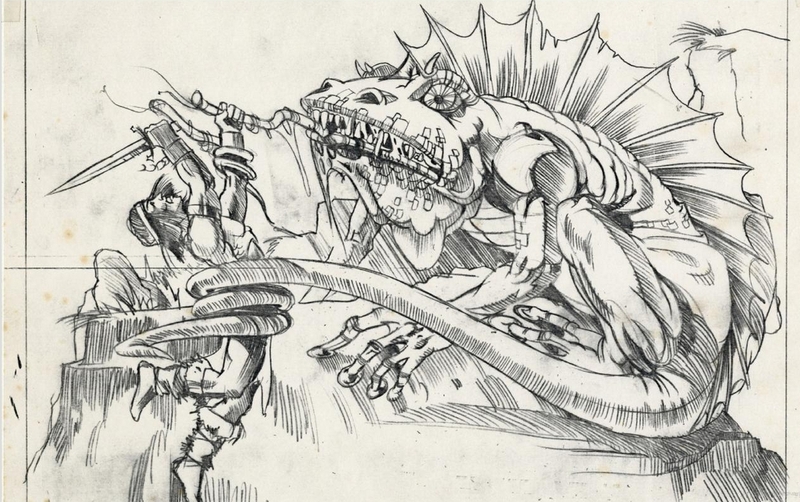 A lot of early toys didn’t have weapons, so the model sheets for animation didn’t have any weapons assigned to them, so generic weapons were done. A bit later a need model sheet for these generic weapons were done. 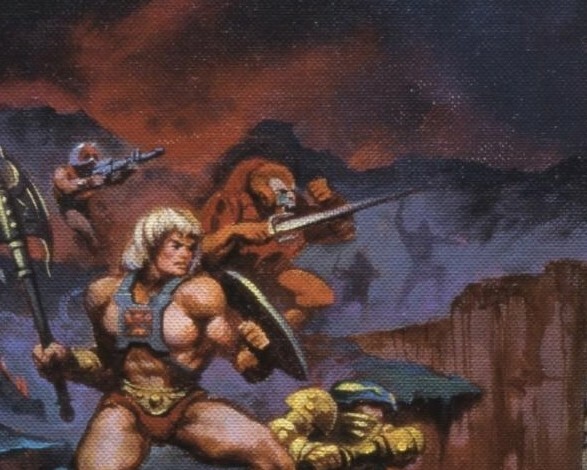 Maybe from box art point, prototypes shown didn’t show a weapon, so a generic sword was added. for the mini-comics.. I would guess the same BUT it had special powers so i’m a bit unsure there..
Good points. The fact that a the same design shows up independently in both box art and mini comics makes me think that the design came from Mattel. From talking with Rudy Obrero I don’t think he was aware of mini comics or anything else other than what he was asked to do. On the other hand, the design isn’t that distinctive, so it’s still possible that it’s a coincidence. See updated blog. I think I was totally off base! The Castle Grayskull/Weapons Pack generic sword makes a decent stand-in. I enjoy this accessory article! you should do more of this! Fantastic article as usual. 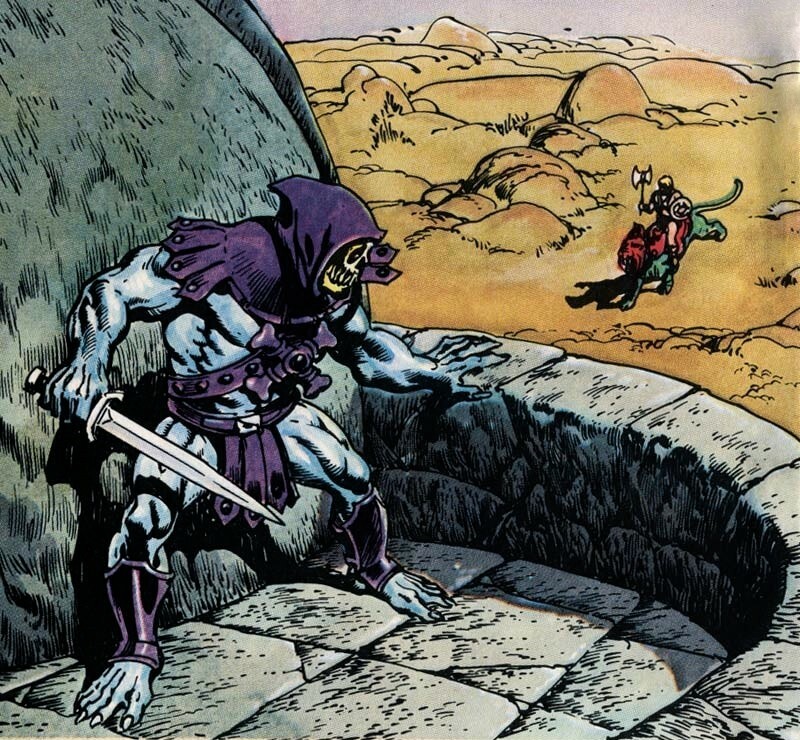 This fantastic sword finally exists in plastic via the great filmation skeletor figure. Glad I subbed for the sword alone. Thanks very much. 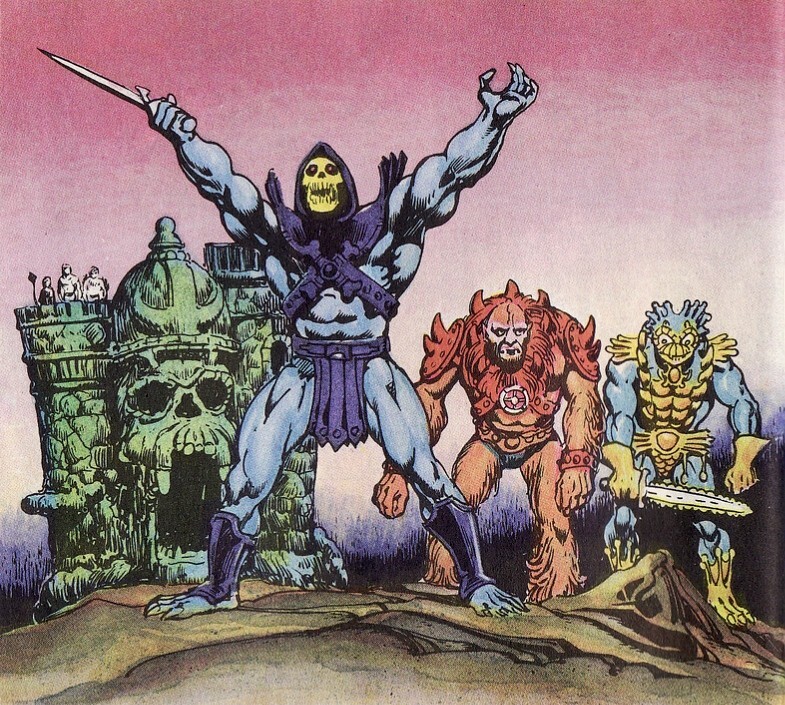 I just got Filmation Skeletor too. Getting that sword inspired me to write about this. 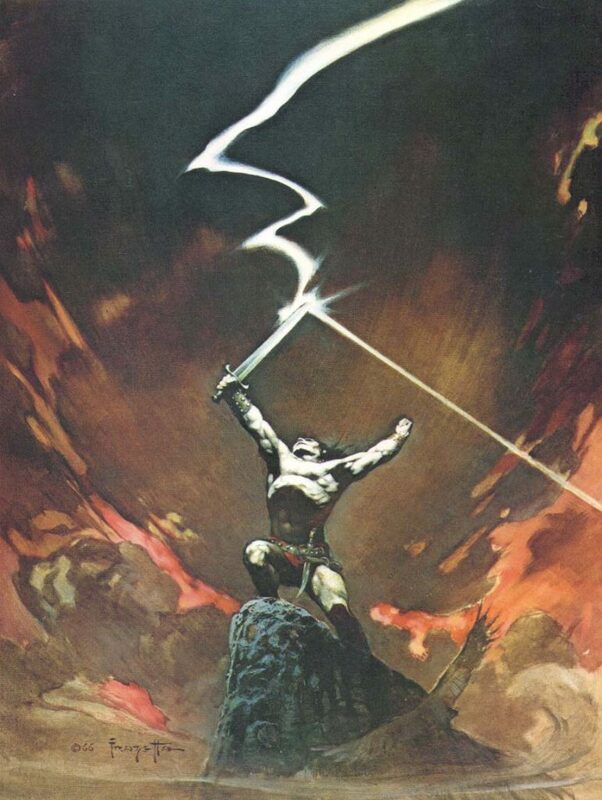 Apparently, the form of that sword in the first four ilustrated books went to Alfredo P. Alcalá and not to Mattel; since it is clear that he would have decided to show it as he used to do with an ordinary sword. As for its creation, however, consider this: Obligatorily, Alcalá made his drawings having available the prose written by Donald F. Glut and not before. 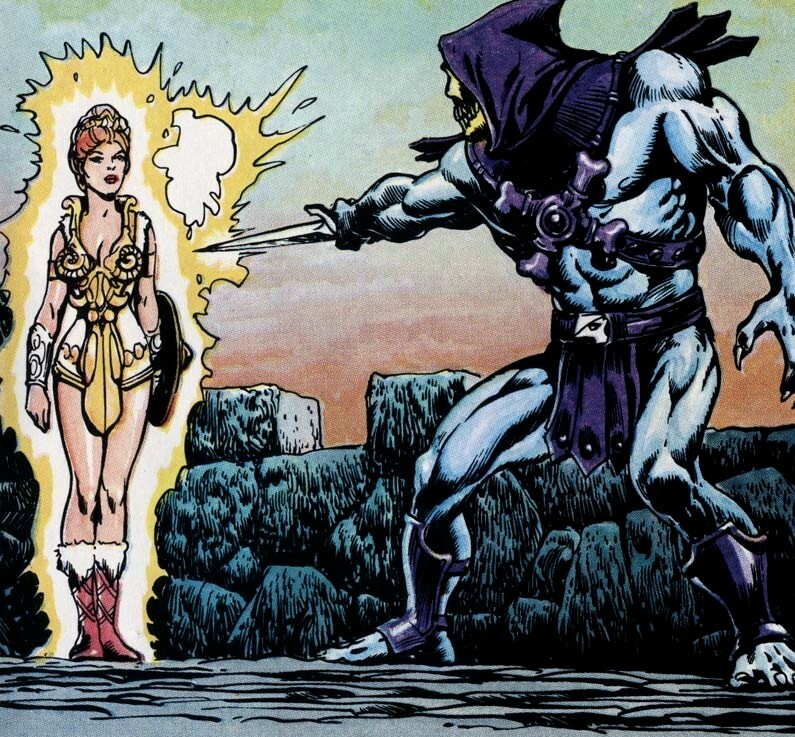 The golden question, then, would be this: Does Glut invented the sword or he included by any reference (visual or written) provided from Mattel? I feel that was an invention of Glut, because it would not be the only contribution totally yours to that prose, although it is not impossible that all or part goes back to Mattel. Thus, beyond its simple appearance, your theory about the authorship of Mattel might even be true. 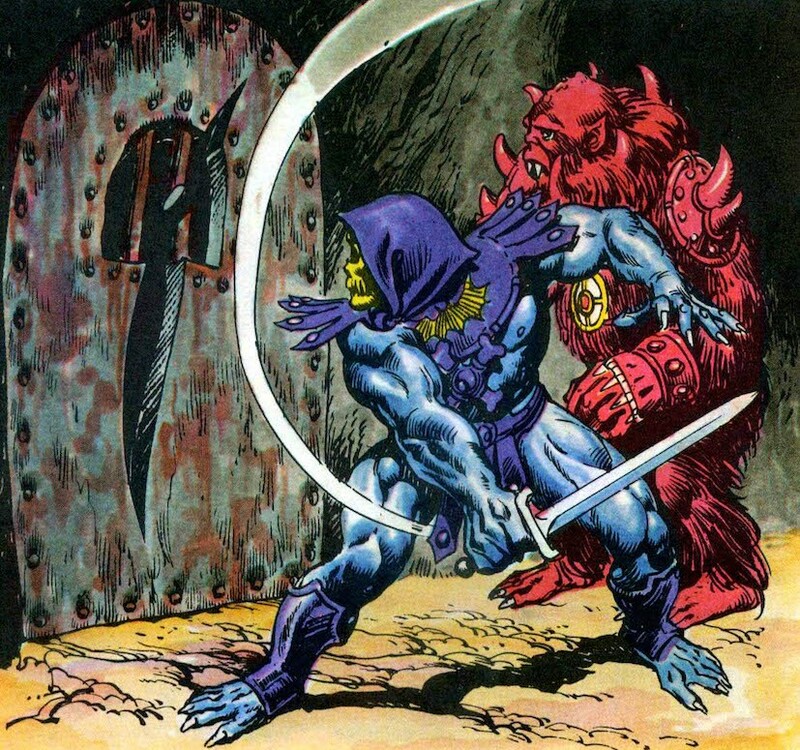 The question of the design may be answered, but it still seems mysterious that Glut’s writing seems to indicate that Skeletor was going to come with two swords instead of a sword and a staff. The staff seems to present in the earliest designs, so maybe it was a miscommunication between Glut and Mattel, or perhaps there was concern they could not include the staff at some point? That’s a good point. 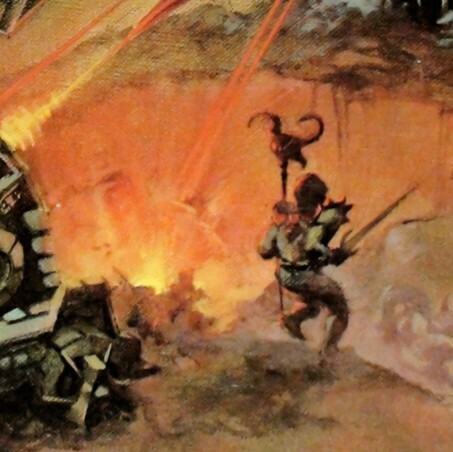 Confusing things a bit more is the Power of Point Dread audio book, where the Power Sword design is called the Energy Blade. Of course that was a year later with a different writer. In any case, one wonders why Glut would have included so much material about an Energy Blade if Mattel hadn’t asked him to. 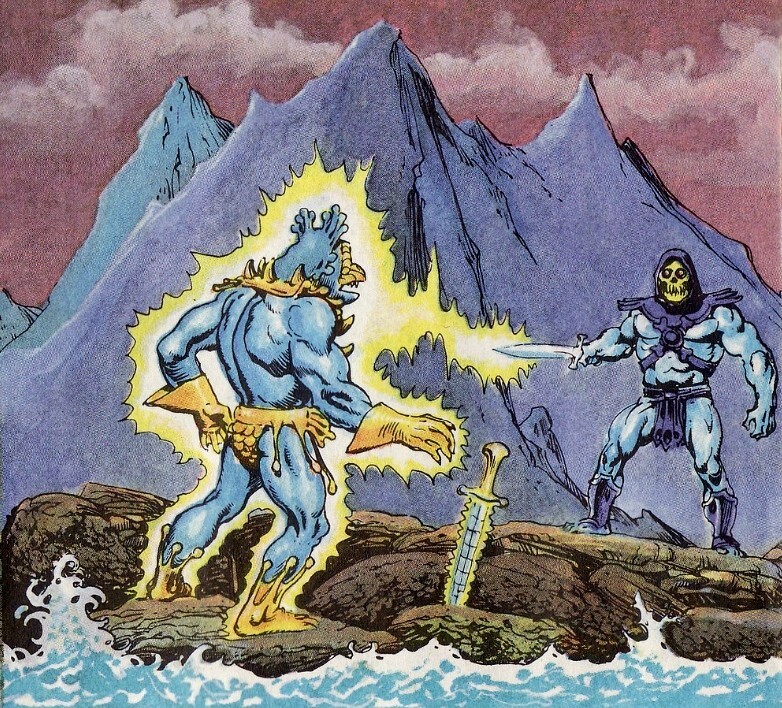 About the two swords.. i’m not so sure cause the Power Sword was two parts.. He-man had one, Skeletor had the other. 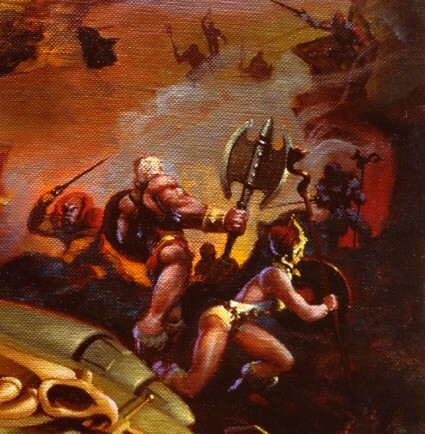 when joined together, they were the Power Sword that could be used to unlock Castle Grayskull. With all the ‘which will have the castle, good or evil’, I think having one side come with both parts kinda.. derails the plot point.. His half could just be called the ‘energy blade’, which being half of the power sword, would explain the powers at times.. was there any appearance of BOTH blades clearly together? 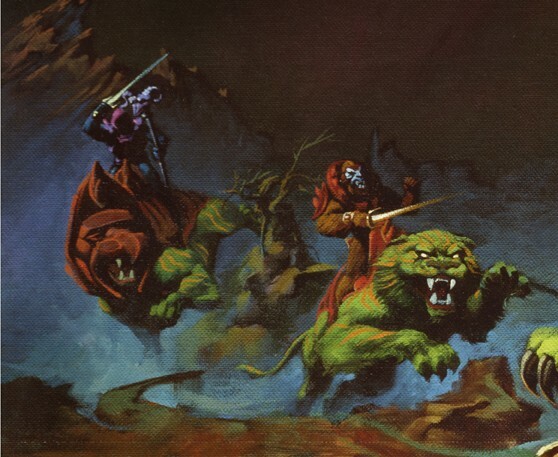 I mean, the one with Skeletor with a sword on the floor.. was that clearly stated (need to look at both image and text) to be a different sword? Interesting post, and a topic I’d never consciously picked up on. To be honest I’d always assumed it was always a ‘generic weapon’, as Manic Man suggests. 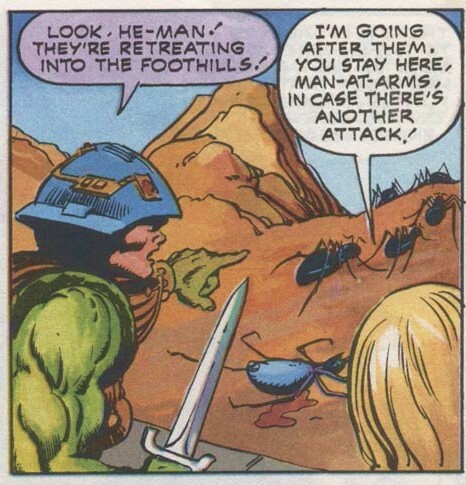 As we well know, those very early mini-comics were written before much of the line was even fully decided on (heck, even characters and their properties weren’t even decided on) and so stories were literally written out of nothing. The oft-disappearing/reapparing sword in question seemed to me to be little more than a convenient ‘generic weapon’ there when needed, and little more than that. 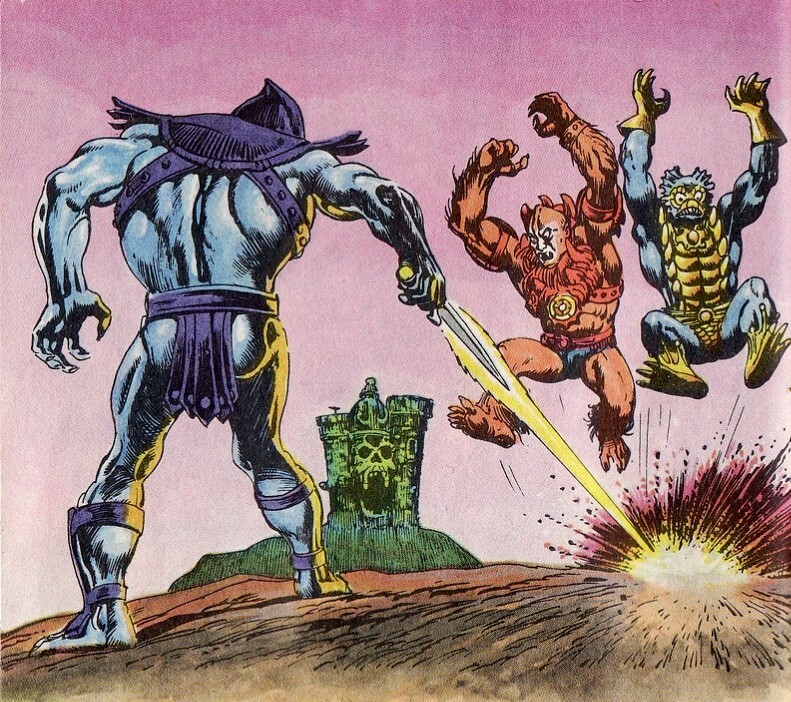 There was the whole things with the two halves of the sword of power, but (as with so many things) this was very up in the air and decided in the early stages of the toyline – I believe Mattel decided to somewhat ‘drop’ that element being much promoted during filming of the first TV spot, and although the two halves still ‘slotted’ together, there wasn’t even any mention of this on the figure packaging. So again, with that an so many elements undecided when constructing stories about a universe that was barely past proposal stage, I think it was all just kinda ‘thrown in there’ in an attempt to tell some kinda story (which didn’t turn out bad, as I love those first four mini-comics).